1PMAS-Arid Agriculture University Rawalpindi, Institute of Food and Nutritional Sciences, Department of Food Technology, Shamsabad, Muree Road, Rawalpindi, Pakistan; 2Punjab Food Authority; 3Rawalpindi Institute of Cardiology, Pakistan. Abstract | Date fruits contain an elevated amount of antioxidants and have potential antimicrobial activity. Effect of drying methods (sun-, oven- and freeze drying) on antioxidant and antimicrobial activities of date fruit powders from three varieties Zahidi, Aseel and Muzafati were investigated. The DPPH activity was significantly higher in Muzafati sundried date powder, whereas maximum phenolic and flavonoid contents were significantly higher in Muzafati freeze dried date powders. Results suggest that freeze dried date fruit powder had the highest potential to be used as functional foods as they are potential source of antioxidants. Date powder also showed probable antimicrobial activity against Escherichia coli. Overall, results showed that freeze drying is the most effective method for gaining maximum antioxidant activity from date fruit powders. Antimicrobial activity and natural antioxidants in date fruit powder showed that it can be used as functional food. Citation | Sohail, A., A. Rafique, K.S. Abbasi and M. Arif. 2019. Comparative impact of drying methods on phytochemical and antimicrobial activities of date fruit powders. 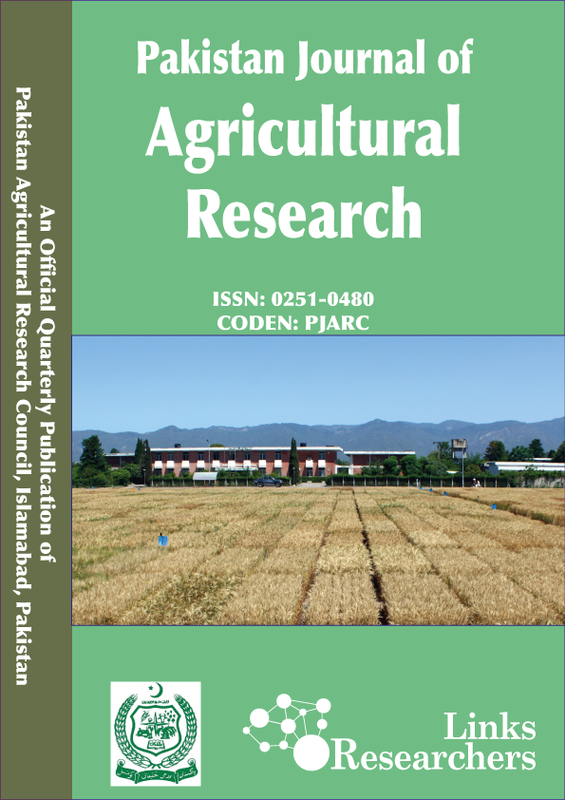 Pakistan Journal of Agricultural Research, 32(1): 1-7. Date palm (Phoenix dactylifera L.) is one of the oldest cultivated crops in the world and was taken as a staple food by the natives due to its high nutritional and economic values. Pakistan has become the 5th largest date producing country with an annual production of 0.54 million tons. The date palm trees have spread over an area of 90.2 thousand hectares. In the year 2007- 08, 557.5 (000 tones) of dates were produced under an area of 90.1 (000 hectares), from which 10 percent were exported and 90 percent were used locally (GOP, 2008). Dates are found to be a good source of energy due to its high amount of digestible sugars. Fresh dates (100 g) provide 213 Kcal of energy while dried dates provide 300-314 Kcal of energy (Al-Farsi and Lee, 2008). Dates also have considerable amount of antioxidants that contribute towards its functional properties. In many ways, dates are considered nearly an ideal food that provides a wide range of vital nutrients with potential health benefits. The date palm has the ability to improve the diet of a substantial number of people in areas where dates are eaten as a nutritious food rather than as a choice food (Al-Shahib and Marshall, 2003). Date palm contains high percentage of carbohydrate mainly glucose and fructose, fats that consists of about 12-14 types of fatty acids (unsaturated), 15 types of minerals and salts, 23 different amino acids in protein, 6-7 (numerous) vitamins and good percentage of dietary fiber. It is extremely nutritious food product rich with calories and lot of vitamins and minerals that are healthy for bone development and healthy growth (Al-Farsi et al., 2005b). It was mentioned that dates are helpful in protecting teeth against decay because of good concentration of elemental fluorine. Another element i.e. selenium was analyzed in date fruit that has antioxidant activity and is believed to benefit in preventing cancer and improves immune function. Addition of date fruit in different food products does not only impart a characteristic flavor but also adds numerous nutrients leading to multiple health benefits (Al-Farsi et al., 2005a). It was discovered that after drying of some date varieties, phenolic compounds are elevated. It is due to the activation of maturation enzymes and degradation of tannins by heat during the process of drying, resulting in releasing of phenolic compounds. It is observed that the bonds between ferulic acid and arabinoxylans, lignin and and p-caumaric acid could be broken at high temperature (Maillard and Berset, 1995). It is found that although date fruit contains significant amount of nutrients that are sufficient for growth of spoilage and pathogenic microorganisms, date fruits can naturally be stored healthily at ambient temperature in a storeroom for numerous months. Therefore, it has been suggested that dates may contain some anti-microbial and antifungal components that increases the microbial stability of date fruits (Nazari and Weiss, 2010). In recent years, interest is growing in the production and usage of oxidants from the natural sources to prevent various health issues related to oxidative damage due to oxidative stress as a main reason in their pathophysiology. In another research inhibition of superoxides and hydroxyl radicals by date fruits, aqueous extract was studied and for the first time dates were identified as having antimutagenic and antioxidant properties. They play a vital role in control of cardiovascular diseases as a result of good quantity of dietary fiber (Vayalil, 2002). Date is a unique fruit in terms of its high nutritional composition. Dates as well as its products are a significant source of instant energy. In Pakistan, dates production is elevated due to favorable environment. Consumption of dates is decreasing in young people due to increasing trend of processed foods so there is still a room to dry date fruit and convert it into powder form by using different drying methods. Drying is a commonly used method of food preservation allowing the increase in shelf life of materials. Low amounts of sodium and cholesterol in dates make it a suitable food for patients of hypertension and Cardio Vascular Diseases (CVD). It can be added in drugs to replace artificial antioxidants that are being restricted these days owing to their carcinogenicity. However, limited research has been carried out on date fruit by-products in Pakistan. Pakistani dates of 3 different varieties Zahidi, Aseel, Muzafati were collected from the local market of Rawalpindi. Dates were washed with distilled water, dried at room temperature, pitted and stored in plastic containers for further processing and analysis. Stored washed dates were dried in order to convert them into powder by using three different methods i.e. sun drying, oven drying and freeze drying. In order to determine the best date powder physico-chemical analysis (including moisture, ash, fat and protein contents), antimicrobial and antioxidant activities were determined (DPPH, TPC and TFC). For sun drying, pitted dates of three varieties were cut manually in small pieces and spread over the trays with proper sunlight within the day from morning till evening after which the dates were packed in polythene bags to avoid moisture. This drying process was continued for 12-14 days (Al-Shahib and Marshall, 2003). Chopped dates were dried till constant weight was achieved. Dates were ground in a mechanical grinder and passed through sieves. For oven drying, stored pitted dates of all varieties were cut in small pieces and spread over the aluminum foil. They were dried by using hot air oven at 50oC for one week till constant weight was obtained (Borchani et al., 2012). Dried dates were ground and passed through the sieves. For freeze drying, pitted dates flesh was grounded and converted into a paste. These pastes of three varieties were frozen at temperature of -50oC and then subjected to drying by direct sublimation of ice under low pressure using a freeze drier (Telstar Spain Cryodas-50). The dried materials were removed and gently ground into fine powders manually and passed through seives. All the date powders were stored in desiccators for further analysis. For the estimation of moisture, ash, protein and fat contents, date fruit powders made by using different drying methods were subjected to chemical analysis through standard AOAC methods (2000). Extraction of non-volatile compounds: The non-volatile components of date powders were taken out for determining antioxidant activity by using solvent extraction method (Fadel et al., 1999). Weighed samples of date powders (15 g for each variety) were taken in a flask containing 45 ml of 90 percent methanol (Merck) on w/v bases. They were shaken on Gallenhamp flask shaker for 48 hrs. Later the extracts were filtered through Whatman’s filter paper No 1. Filtered samples were stored in freezer for further analysis. Cold extraction: Cold extraction was carried out for determining anti-microbial activity of date fruit powders. 5 g of each date fruit powder was soaked in 25 ml of cold distilled water for 24 hrs and then soaked mixtures were filtered and centrifuged at 5000 rpm for 5 min in Hermle-Z-200A centrifuge. The supernatants obtained were separated and stored at 4oC for further use (Al-Daihan and Bhat, 2012). 1- diphenyl-2-picrylhdrazyl (DPPH) scavenging activity: For every sample, 0.5 ml of a DPPH methanolic solution (7.8 mg DPPH (Sigma Aldrich) in 100 ml methanol (Merck)) was added to 1 ml of each extract. After vigorous shaking, all mixtures were left to stand in the dark for at least 30 min at room temperature. The absorption at 517 nm showed antioxidant activity using spectrophotometer and links to the ability of extract to reduce the DPPH radical onto yellow-colored diphenilpicryldrazine (Kim et al., 2005). Radical scavenging activity is calculated by using following formula. Ao = absorbance of control at 30 min; A1= absorbance of sample extract at 30 min. Total Phenolic Content (TPC): Total phenolic content of date powder extracts were determined by using Folin-Ciocalteu reagent. The extract as prepared (200 µL) of each variety was mixed with 1.5 ml of Folin-Ciocalteu reagent (Sigma-Aldrich) for 5 min at room temperature. Later on 1.5 ml of aqueous sodium bicarbonate (60g/L) was added to each extract mixture and all mixtures were vortexed and allowed to stand at room temperature. After 90 min, the absorbance was measured at 725 nm (Al-Farsi et al., 2005a). The phenolic activity was then estimated by using gallic acid standard curve and results were expressed as mg gallic acid equivalent (GAE) per 100 g of dry weight of date powders by using spectrophotometer (UV 9200, Biotech Engineering UK). Total Flavonoid Content (TFC): Distilled water (4ml) was added to 1ml of each date fruit extract in test tubes. Then 5 percent of sodium nitrate solution (0.3 ml) was added followed by adding 10 percent aluminium chloride solution (0.3 ml). Test tubes were incubated at 28oC for 5 min, and then 2 ml of 1M sodium hydroxide were added to the incubated mixtures and volume of reaction mixtures were made up to 10 ml with distilled water. The mixtures were vortexed thoroughly and the absorbance of color developed was determined at 510 nm using spectrophotometer (Kim et al., 2003). A standard curve was prepared with quercetin and results were expressed as mg QEQ/100g of dry weight of date fruit powder. For determining the antimicrobial activity of date powders, their cold extracts were examined against the pure bacterial culture of E. coli by using paper disc diffusion method (Kim et al., 1995). E. coli culture was obtained from Food-Microbiology Laboratory, Department of Food Technology, UAAR. Nutrient agar plates were made and 200 µl culture strain was spread on each plate. Sterilized 6 mm discs of Whatman’s filter paper No 1 were placed on nutrient agar plates. Date powder extracts (20µl) was added carefully on the discs by using micropipette. For 24 hrs. plates were incubated at 37°C till zone of inhibitions appeared. Antibacterial activity was determined by measuring the zone of inhibition around discs in mm. Two factor completely randomized design was applied on all research parameters. Results were collected and compiled by using Statistix 8.1 software (Analytical Software, FL, USA). Analysis of variance was applied on drying methods and interaction between them was calculated by Least Significant Difference (L.S.D) method of comparison at 5% level of significance (Steel et al., 1997). Results show that there is highly significant difference among date fruit powders for their moisture content. The difference in moisture content for various drying methods is might be due to uncontrolled parameters in sun drying while controlled and high temperature in oven drying. Low pressure technique of freeze drying is found more efficient as minimum moisture content is observed in freeze dried date powders as show in Table 1. It shows among the tested varieties and drying techniques Zahidi date powder with lowest moisture content can be selected for formation of better quality date powder with less moisture and low lumps formation. However, Aseel date powder showed moderate moisture content but highest moisture content of Muzafati dates powder made it less acceptable as compared to others. Table 1: Proximate analysis of date fruit powders in percentage. Table presented the values of mean of three replications. Mean carrying same alphabetic letter are statistically non-significant at α P<0.05. Table 1 also shows that using different drying methods did not affect the mineral contents of date fruit powders. The difference in ash content among different varieties used for formation of date fruit powders is influenced by genetic factors and environmental conditions prevailing during development and maturation stage of date fruits (Chao and Krueger, 2007). Results showed that date powder in value added products can be a good source of minerals with pharmacological effects. Using different drying methods for formation of date powder of each variety did not bring any significant change in protein content of that variety. There is non-significant difference in protein content of same variety with different drying methods. However, the difference between varieties regardless to drying methods may be due to the difference in climatic and storage conditions. It is found that variation among different date fruit verities is highly significant (p<0.05) for fat content but different drying methods for same variety did not affect the fat content of date fruit powders of that variety. Low fat content in date fruit powders make it suitable for diet conscious consumers and cholesterol patients. DPPH scavenging activity: This method helps to measure the ability of antioxidants to scavenge specific DPPH radical. The highest mean 85.18 percent was calculated for oven drying while the lowest mean 83.733 percent was observed for freeze drying. Sun drying showed more antioxidant activity followed by oven drying and the lowest antioxidants are reported in freeze drying as shown in Table 2. This difference in mean values of tested samples might be due to change in temperatures of applied drying methods as linkages between certain organic acids could be broken with increase in temperature followed by release of antioxidants (Maillard and Berset, 1995). Muzafati date powder showed the strongest DPPH scavenging capacity up to 88.71 percent whereas Zahidi date powder had lowest mean value 79.46 percent as compared to others. Sundried Muzafati showed more DPPH scavenging activity and also high moisture %. Total Phenolic Content (TPC): Amount of antioxidants is also influenced by concentration of total phenolics present in date fruits. Maximum value of TPC 290 mg GAE/100g DW is observed for freeze drying, 265.7 mg GAE/100g DW for sun drying and lowest TPC 242.23 mg GAE/100g DW is reported for oven drying (Table 3). Table 2: Comparative analysis of DPPH activity of date fruit powders. Table 3: Comparative analysis of Total Phenolic Content of date fruit powders. The decrease of TPC in oven drying is due to degradation of phenolic compounds at high temperature up to 50oC. Sun drying could not inactivate the degradative enzymes such as polyphenol oxidases, therefore phenolic compounds are lost during long time drying (Orph Anides et al., 2013). The benefits of freeze drying can be attributed to the fact that this drying method minimizes the degradation of heat-sensitive antioxidant phenols in date powders because dehydration is performed at lower temperatures. In addition, freeze drying enhances the extractability of phenolic compounds from date powders since ice crystals within the sample matrix can rupture cell structure (Goulas and Manganaris, 2012). Higher values are recorded for Muzafati dates 321.25 mg GAE/g. Therefore, the order of TPC of date fruit powders is Muzafati>Aseel>Zahidi. Total Flavonoid Content (TFC): Antioxidant activity in date fruits can be analyzed through quantity of flavonoids that are responsible for antiradical effects in date pulp (Chaira et al., 2009). Maximum TFC is reported for freeze drying, followed by 46.711 mgQEQ/100g DW in oven drying and the minimum concentration is observed in sun drying (Table 4). The difference in TFC of drying methods is probably due to temperature and time used for making date fruit powders. Harsh drying conditions in oven drying and long duration of sun drying can lead to loss of macromolecules like flavonoids (Schieber et al., 2001). Table 4: Comparative analysis of Total Flavonoid Content in date fruit powders. Muzafati and Zahidi are non-significantly different from one another for TFC but considerably different from Aseel that has shown lowest concentration of TFC that has shown the lowest mean 38.011 mg QEQ/100g. Good amount of TFC have anti-mutagenic properties with strong antioxidant effects. Therefore, date powders can be selected as nutritional ingredients particularly freeze dried date powders. Results in Table 5 shows that date fruit powder extracts have strong antimicrobial activity against E. coli. No significant effect of drying methods is observed on antimicrobial activity of date fruit powders. Among date fruit varieties extracts of Muzafati date powders showed maximum inhibition zones up to 15.0 mm, Aseel showed 12.3-13.3 mm and minimum inhibition zones were observed for Zahidi date powder extracts 9.6-11.3 mm. Antimicrobial activity of date fruit powders make it suitable for use in pharmacology and adding date fruit powders in processed foods can improve shelf life of final products. Table 5: Antimicrobial activity of date fruit powders against E. coli. The present study was conducted to compare and evaluate three different drying techniques; sun drying, oven drying and freeze drying for making date fruit powder with good phytochemical and antimicrobial potential. Among the drying methods, freeze drying was considered the most efficient, as maximum moisture loss was observed. Proximate analysis of date powders showed that all drying methods had no effect on protein, ash and fat content. Comparisons showed that maximum antioxidants; TPC, TFC and DPPH activity is lost in sun drying while minimum losses are observed in freeze drying that makes it more effective drying method to make date fruit powder with maximum phytochemicals. abstract and Methodology and is the corresponding author. Kashif Sarfraz Abbasi: Did Statistical analysis and Data entry. Maryum Arif: Introduction, references and conclusion. Chao, C.T. and R.R. Krueger. 2007. The date palm (Phoenix dactylifera L.): overview of biology, uses and cultivation. Hort. Sci. 42(5): 1077-1082. Fadel, H., F. Marx, A. El-Sawy and A. El-Ghorab. 1999. Effect of extraction techniques on the chemical composition and antioxidant activity of Eucalyptus camaldulensis var. brevirostris leaf oils. Z. für Lebensmitteluntersuchung und-Forschung A. 208(3): 212-216. GOP (Government of Pakistan). 2008. Fruit, Vegetable and Condiments. Statistics of Pakistan. Ministry of Food, Agriculture and Livestock (Economic Wing), Islamabad. Nazari, S.H. and J. Weiss. 2010. Evidence of antimicrobial activity of date fruits in combination with high intensity ultrasound. Afr. J. Microbiol. Res. 4(7): 561-567. Steel, R., J. Torrie and D. Dickey. 1997. Principles and procedures of statistics: A Biometric Approach. McGraw-Hill, New York.